Disguised as harmless suburbanites, “the Rents” are actually psychotic assassins, determined to take their place at the top of Arcadia’s food chain. Leigh delivers X’s traditional warning . . . but ends up in a construction site firefight with some very unpleasant soccer moms! Tony Parker steps in as guest-artist for this issue, while regular artist Eric Nguyen drew the cover. 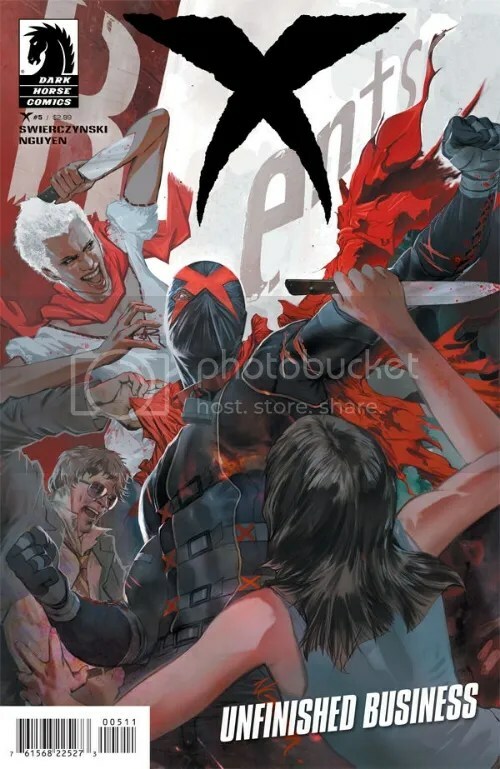 Duane Swierczynski continues his revamp of the Dark Horse urban vigilante X with this single-issue story, taking a bit of a breather in-between arcs. We open with a flashback to an event we saw in X #0, when one of “The Three Pigs” hired a bunch of assassins to go after X, but X ambushed them and started shooting them. We learn that three of the assassins managed to get away. A simple-looking man calling himself The Accountant and a couple of middle-aged women called Mother Nature and Mother Invention. Flashforward to the present, it’s a month since Berkshire was killed. The three assassins, now calling themselves The ‘Rents, have decided to take advantage of the absence of a central crime figure in Arcadia. Having stolen Berkshire’s secret blackmail files, they begin shaking down various politicians and businessmen in the city. X anticipated that someone would try to take Berkshire’s place, and had previously bugged City Hall. So when he finds out about The ‘Rents, he sends Leigh out to hand them pictures with one half of a red X marked on them. Leigh almost gets caught, as The ‘Rents chase her, leading to a construction sight where they surround her. But X is waiting in a nearby building and picks off the two ladies with a rifle, then gets into a gunfight with The Accountant, leading him into a booby-trap where he is blown up. Leigh isn’t happy about this turn of events, she thought X was just going to warn them, not kill them, and now she fills partially responsible for these deaths. X argues that its what they deserved, and he and Leigh split before the cops arrive. Buy it NOW on DarkHorseDigital.com!